In a press release dated February 7th Tyson Foods Inc. (TSN) announced results for the 1st Quarter of Fiscal 2019 ending December 29th 2018. In commenting on results Noel White, president and chief executive officer. 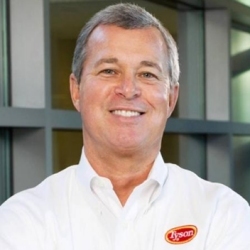 said "our diversified business model continues to set Tyson Foods apart," He added "the Prepared Foods and Beef segments delivered strong results in our fiscal first quarter, while the Pork and Chicken segments performed well given market conditions. We're proud of the growth Prepared Foods has achieved in the past five years and the role it has played in stabilizing volatility while growing earnings. Moving forward, we will remain focused on growing Prepared Foods as well as our value-added and international businesses. In relation to the $2.1 billion acquisition of Keystone Foods, White noted "In the first quarter, we completed the acquisition of Keystone Foods. I'm pleased with the progress of the integration and remain confident Keystone will play an important role as we execute our growth strategy, particularly with strategic customers and in key international markets. Commenting on the future and confirming guidance White opined "Fiscal 2019 holds many opportunities for Tyson Foods. Global protein demand remains strong, and we are well positioned to meet the demand with our diversified business model and differentiated portfolio. Our cash flow and strong balance sheet support our capital commitments and our growth strategy. Our team is focused on the success of our stakeholders, and I am confident in our ability to deliver on our fiscal 2019 outlook of $5.75-6.10 adjusted earnings per share while enabling long-term, sustainable growth."